Throughout this week, as we journey together through Holy Week, we continue the gradual build-up from Palm Sunday, with services each evening in this group of parishes. We began in Saint Mary’s, Askeaton on Monday [10 April 2017], moving on to Saint Brendan’s, Tarbert, yesterday [11 April]. This evening we are here in Holy Trinity Church, Rathkeale. Tomorrow, we travel on to Castletown Church for the Maundy Eucharist [13 April 2017], so that we can mark Good Friday prayerfully and appropriately in Saint Mary’s Roman Catholic Church, Rathkeale, at noon on Friday and in Saint Mary’s Church, Askeaton, that evening. Today is popularly known in Ireland and in other countries as Spy Wednesday, because, as in today’s Gospel reading (John 13: 21-32), this day is thought of as the day Judas Iscariot agreed to show the chief priests where they could easily capture Christ, betraying him for thirty pieces of silver (see Matthew 26: 14-16; Mark 14: 10-12; Luke 22: 3-6). 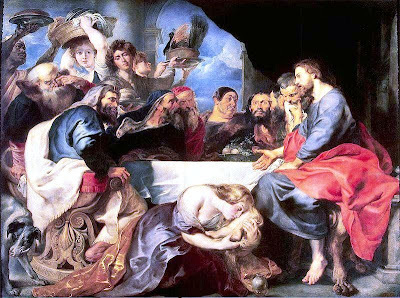 In the Orthodox tradition, on the other hand, this Wednesday is associated with the dinner Christ had in the house of Simon in Bethany. There he was anointed on the head by Mary with very expensive ointment. Some of the disciples were indignant at this apparently wasteful extravagance, claiming the myrrh could have been sold and the money given to the poor. But Christ told them that the woman’s actions would be remembered wherever the Gospel is preached (Matthew 26: 13), for she had anointed him in preparation for his burial (Matthew 26: 12). Judas went to the Sanhedrin and offered them his support in exchange for money. From this moment on, Judas was looking for an opportunity to betray Jesus. In the Orthodox Liturgy today, the hymns of the Bridegroom Service remind us of the woman who poured precious ointment on Christ’s head at Simon’s home (Matthew 26: 7). Those two principle themes are interwoven in the texts of the Orthodox liturgy today: the betrayal of Christ by Judas, and the anointing of Christ by the woman in Simon’s house in Bethany (Matthew 26: 6-16). This woman draws a sharp contrast with Judas. She is a repentant sinner, and as she prepares for the death and burial of Christ she is reconciled with God. Judas, who has been given everything by Christ, shows no gratitude and turns his back on salvation. The theme of anointing is continued in most Orthodox parishes this evening, when the principle evening service is the Anointing of the Sick. Whether we have everything, or we have nothing, the choice we face this Holy Week is the choice faced by Judas and this woman: between darkness and light, between death and life, between turning our back and walking way, or being reconciled with God. Judas cannot accept himself, and in so doing rejects Christ. On the other hand, the woman who finds mercy in Christ finds she can now accept herself. The fourth-century Church Father Evagrius Ponticus says we can only encounter God if we are prepared to encounter ourselves in truth. When we can acknowledge and accept our own darkness, then we are able to accept others. (Revd Canon Professor) Patrick Comerford is Priest-in-Charge, the Rathkeale and Kilnaughtin Group of Parishes. This Holy Week reflection was prepared for Compline in Holy Trinity Church, Rathkeale, on 12 April 2017. I often joked that when it came to moving out of Dublin, I wanted to live in a town large enough to have all my needs within walking distance, including a church, a newsagent, a coffee shop, a pharmacy and a book shop. Perhaps I had always imagined returning to a town or small city such as Wexford or Lichfield, or perhaps even Kilkenny or Carlow. Despite some formative early years on my grandmother’s farm near Cappoquin, in west Waterford, I never thought of myself as a ‘country boy.’ I am more of what people in provincial Ireland know as a ‘townie’ and I enjoy all the benefits of town-living, including proper public transport. I might never have thought of a small town like Askeaton, but I have been here for almost three months, and I am enjoying every moment of life here, with country walks, riverside walks and a rich tapestry of local and church history that I am only beginning to explore. The provincial bus strike that has lasted for three weeks has left me cut off from easy access to Limerick. Although it is only 25 km away and less than half an hour’s drive from Limerick, I cannot drive and so I am missing ready access to Limerick, with its beautiful architecture and its great bookshops. Of course, Saint Mary’s Church is just a few paces from the rectory, and the supermarket, a small café, the pharmacist, and walks by the River Deel are all on my doorstep. But I miss having a good bookshop to browse and delight in. This afternoon, I signed up for the local library. It’s small, and it is only open for 18 hours a week. But without easy access to Limerick, it offered a lifeline this afternoon, and I spent a little time there after signing up, browsing the books on the shelves, especially those on local history. The library is housed in Polly O’Mahony House, a former school looking out across the River Deel as it flows swiftly under the bridge and on down past the ruins of Askeaton Friary. Polly O’Mahony founded Saint Mary’s Secondary School here in 1940, and this became the library when a new school was built on the site of the former Church of Ireland school beside Saint Mary’s Church. My fire was lit this afternoon, I signed up for this small library, and I borrowed my first book. In our pilgrimage and journey in Lent we have arrived at Holy Week, the last week in Lent. In our pilgrimage and journey in Lent we have arrived at Holy Week, the last week in Lent. Every evening in Holy Week, there are special services in the churches in the Rathkeale and Kilnaughtin Group of Parishes. This evening’s service (12 April 2017) is in Holy Trinity Church, Rathkeale, Co Limerick, at 8 p.m.
A woman poured expensive perfume on Jesus’ head… They found fault with the woman. Men fight wars; men flex their muscles in the home. Pray for peace.